You'll find a wide variety of portable toilets here to choose from. Portable toilets are great for camping, for use on boats, and for the elderly and bedridden who are unable to get to the bathroom quickly, if at all. In addition to those uses, a portable backup toilet is an excellent thing to have on hand if your household toilet(s) are temporarily out of commission! In addition to fabulous portable toilets, you’ll find chemicals, bags and other portable toilet accessories. There are many different kinds of camping toilets, and some of them are commonly used on boats because of their ease to install and their inexpensive cost. 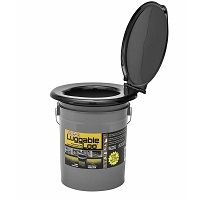 This deluxe portable toilet has a 2.6-gallon reservoir, a 6.3-gallon holding tank and is under 16.5″ high. It’s perfect for an emergency backup toilet, camping, RVs, sick rooms, hiking and more. There’s a level indicator that allows you to easily see what your waste level is. The toilet seat is 20% larger than normal for comfort. It flushes easily with a durable piston pump and has a two-directional rinse for enhanced bowl surface coverage. Easy to clean and use the Sanitation Equipment Visa 268 Deluxe Portable Toilet includes a leak-proof and odor-proof seal as well! 1) Ease of installation. Carry it on board, secure it, and you’re done. 2) Easy to fix. i.e. carry it out to the trash and buy a new one. 4) No hoses to stink. 5) Fewer hoses and clamps, so fewer chances to leak. 1) Not as easy to empty. You have to remove the tank and carry it to a place where you can empty it. This is a big drawback. Thetford has been producing portable toilets for years, and the quality of their products is amazing. They make all types, but the flushing porta potty is one of the best I’ve owned, and for this reason, I tend to recommend them to my friends. One of the most popular models is the Thetford porta potty 365. It features a piston flush pump and a 5.5-gallon holding tank. This capacity means that you are not going to be needing to empty this toilet more than once every 20-30 uses, although, after 30 uses, you want to be VERY careful how you empty it!!! It features a handy level indicator to tell you how full it is. For those looking for high quality, durable, portable toilets for marine use, camping, or for use in a recreational vehicle, the Sealand SaniPottie will become a friend and trusted companion very quickly. 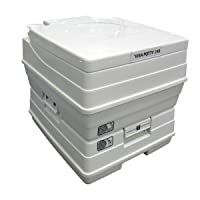 The SaniPottie range is quite diverse, and Sealand has provided a range of tank capacities, ranging from a little over 10 liters, up to a 19-liter holding tank (2.8 – 5 gallons) Sealand state that this holding tank range will allow for up to 30 to 50 uses. What sets the Sealand range off from some of the other competitors is the amazing durability of these units. They are super tough, manufactured from high-density polyethylene plastic. Sealand says that you can drop it and stand on it, and the toilet won’t suffer at all. The finish on the Sealand SaniPottie range is matt, and the finish is fairly scratch resistant. These portable toilets will look as good as new for many years. One thing that has been something of an issue for me with the portable toilets that I have used in the past is that after sitting on them for anything more than a few minutes, my backside starts to ache like hell. Not so with the Sealand range, these are extremely comfortable, but I would still advise against sitting on one with the newspaper for half an hour, you may never get up again! Sealand has produced a product that is equally at home on the land or the water. 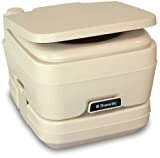 Sanipotties are a favorite of boat owners and are considered to be the ideal marine toilet for use in small vessels. Equally as effective as a camping porta potty, or for use in RV’s, trailers, caravans, for potty training your child, or even as an occasional toilet at the run down weekender you are renovating. Spare parts are easily obtainable, but you should not need them too often. As with all portable toilets, the seals are the area that wears, due to perishing of the rubber, but these are cheap and can be replaced at home in a matter of minutes. There is little doubt, which for both seasoned adventurers or the new traveler who wants to experience the great outdoors but still have some home comforts, the Sealand SaniPottie will meet your needs for many years to come. To me, the closest I get to going camping in the rough is staying at the Hilton! I will never, ever be using a hole in the ground for a toilet, thank you… so a portable toilet like this one is a brilliant solution for people who want to enjoy the best of nature, but to bring some civilization with them when it comes to using the bathroom! Every lives aboard sailor has a toilet horror story, and it doesn’t seem like there is any, one, clear cut answer that solves every person’s problems. Each solution has an upside and a down side, but none of them seem to offer a universal, perfect fit so let’s examine the pro’s and cons together. This situation can be easily fixed for dedicated fishers and boating enthusiasts – just BYO toilet! I think that this is the first time I have seen a portable toilet with the toilet paper roll holder embedded in the lid!!! what a clever idea – I wonder if a woman thought of that design feature? Have you ever been up before dawn to enjoy a full day of boating and fishing… only to be faced with the discomfort of needing to use the toilet, while being in the middle of the ocean, and no privacy? There is no more heinously evil, frustrating, disgusting, malevolent presence on your boat than the toilet, what we salty’s call the head. If you ever want to see a grown sailor cry, ask him about his head, but stand back, because he will burst into tears and weep like a small child. A portable camping toilet is…portable! And not just for camping! Think about road trips when you waited in agony for a bathroom or port-a-potty to miraculously appear. Intense moments but portable camping toilets can come to the rescue. These take-anywhere potties are convenient for emergencies, camping, long trips, base camps, etc. What do you need? Are you looking for a new portable toilet for camping? Having a portable camping toilet makes it more convenient for the entire family when camping. Portable camping toilets are available in several styles and models that make camping more enjoyable for everyone. Featured below are the best selling portable camping toilets available for this camping season. Camping can be a real pleasure or a right royal pain in the backside. I love the outdoors, but my wife and kids are never too keen to do their business behind a trees or bush. I’ve never really been too concerned, but it was certainly becoming an issue when we went away. After the trips had got less and less frequent, we decided something had to be done to get our holidays back on track, and the decision to buy a porta potty was made. Which Porta Potty Should YOU Buy? For most of us, the idea of taking a porta potty of some sort on a camping trip does not enter our minds when we are young, adventurous, and happy to bare out butts for the world to see. But as time goes on, we get married, have kids, get BIGGER butts, the desire for a few home comforts tends to grow………..as do our behinds. We still want to feel young and vibrant and at one with Mother Nature, but we want to take things with us that make the outback feel like a home from home. We want to take not only the kitchen sink with us but also the toilet, the crapper, the kludge, the dunny, the throne……..whatever you want to call it. But hold on, this is a reality, you can take a toilet with you, albeit a small one. The range of portable toilets for camping and marine use is large, and whatever your budget, there is a portable toilet to suit you. Over at the PortaPotty.org website, those toilet minded folks are offering reviews on a wide range of travel toilets for camping, RV and caravan use, and even for boats. If you are just an occasional camper, then one of the frames with a toilet seat on top may be all you need. You simply hang a plastic bag underneath the seat, tie a knot in it when you are done, and throw it away. It does mean having to find a suitable disposal place, throwing a sack full of crap into a bin in the nearest shopping mall may not be socially responsible. Alternatively, you could get one of the bucket style toilets like the Reliance Luggable Loo. These are simple, lightweight and are essential, well, eh, a BUCKET with a lid. I think you probably get the idea of how to use one of these. No further description required. At the top of the range, for really posh people, the flushing porta potty is pretty much a standard toilet concept, but in miniature. It has a water tank, a holding tank for the waste, and either a bellows style flusher or one that runs on batteries. They provide pretty good bowl cleaning and are fairly simple to clean out. It’s not the best job in the world, but it could be a lot worse, I assure you. 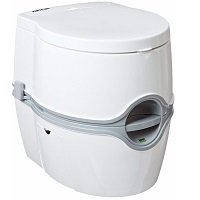 These flushing camping toilet units retail for under $20 for a simple seat, frame, and bag design, up to around $130 for a nice flushing portable toilet. One thing I love about this model is the height. At over 16 inches high, it’s taller than many home toilets. Getting on and off is easy, even for your old gran. It is not the cheapest toilet out there and will set you back around $130 on the Amazon site, but it is one hell of a toilet. Reliable and durable, you can even use it as a step! !